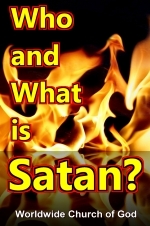 Doctrinal Outlines - Who and What is Satan? JUST WHAT DO YOU MEAN: BORN AGAIN? Did Christ Die of a BROKEN HEART? The B-2 stealth bomber, an airplane developed by the United States government, is touted to be invisible to enemy radar. The plane supposedly can perform the ultimate disappearing act! Can it? Or do we know of an invisible enemy who has been around for millennia, wreaking havoc? He is Satan the devil, and although unseen, he is real! You need to know, for an enemy you can't see may be an enemy who doesn't exist. Or he may be an enemy who not only exists but is your most fearsome foe! If the Bible is our authority, then the answer is clear: Satan not only exists, he is a powerful, wicked, spirit being. He was created perfect, but became corrupted by sin. He is the invisible leader of all fallen angels, the unseen author of all evil and the tempter deceiver and, destroyer of mankind. Because Satan is a spirit and unseen, humanity has forged many false ideas about just how he must look. He is often imagined to be a short, skinny elf in red tights, with pointed ears or horns, a barbed tail and a pitchfork in his hand. Sad to say I this erroneous mental cartoon of Satan's appearance seems so funny that many conclude he is but a harmless little creature on a par with a villain from a Walt Disney film. A few philosophical types view Satan as a convenient — but totally imaginary — way to describe or personify all the evil in this world. Others have no use at all for the devil, and consider him a total fake, pure and simple. But some religious people are downright, openly afraid of the devil. They ascribe to him personally every bad thing that happens to them, be it a failed marriage or a flat tire on their car. To begin, the Bible shows that three levels or classes of being exist in the universe. Man and animals, both composed of physical matter, make up one class. The spirit-composed members of the God Family, which at present includes God the Father and Jesus Christ (John 1:1-2, 14), are another class, the highest form of life. The third class of being is the angels. Angels are "spirits" (spirit beings — Hebrews 1:7) who serve as God's helpers as He unfolds His plan for man (verse 14). Hebrews 2:5-7 explains that man right now is lower than the angels. But man will eventually be set in authority over angels when he is finally resurrected as a spirit being (verse 8, I Corinthians 6:3). Thus we see that angels are spirit beings of superior power and authority to man. They minister as God's servants in matters God directs. Within the angelic realm, differing ranks or stations of angels exist. Two that the Bible mentions specifically are the cherubim (Genesis 3:24) and the seraphim (Isaiah 6:2). We can conclude from biblical evidence that there are probably just two cherubim, and that they hold special responsibility at God's throne. More on this below. Some angels are righteous and are wicked (Luke 11:26), the latter having "sinned" and been "cast down" (II Peter 2:4, Jude 6). These fallen angels — demons — have over them a ruler or prince or boss. His name is Satan (Matthew 9:34, Luke 11:14-19)! Exactly how did Satan come to his position as chief of the wicked spirits? Two main portions of Scripture fill in the important details: Isaiah 14:12-15 and Ezekiel 28:12-17. Isaiah 14 starts with a taunt against Babylon, which carried the nation of Judah into captivity. Verse 12, however, makes a literary jump into prehistory and begins to speak to the real power behind Babylon. — Satan the devil, here called Lucifer. Verse 12 exclaims that Satan was "cut down." Verses 13 and 14 reveal that the thoughts of his heart had been to exalt his authority even above God's — actually to knock God off His throne! Verse 15 shows that these evil plans were ill-fated, for God was to bring him "down to Sheol, to the lowest depths of the Pit." Notice how these verses parallel Christ's statement that He beheld Satan "fall like lightning from heaven" (Like 10:18), and Peter's record that the demons were "cast down" from God's presence (II Peter 2:4). Continuing, now in Ezekiel 28, we find more of the details. Ezekiel 28 opens with a prophecy against the ancient city of Tyre, a powerful seacoast kingdom in Palestine during Old Testament times. The prophecy against the entire city is couched in terms directed to the "prince" or ruler of Tyre, since the ruler is responsible, in God's eyes, for the sins of the city. But in verse 12, a complaint or cry is made, not against the "prince," but against the "king" of Tyre. The language that follows makes it plain that no human being is spoken of here, but rather that the evil power behind the prince of Tyre — the king of evil, Satan the devil — is actually being addressed. Verse 12 shows Satan was created full of wisdom and perfect in beauty. Verse 14 states that Satan was an angel of the type or rank of cherub. He had been at the very throne of God! Verse 15 says he had been created perfect, but that iniquity "was found" in him. Verses 16 and 17 indicate his sins included vanity, covetousness and selfishness. Before summarizing these two sections, it is helpful to briefly cite Revelation 12:3-4. Here we see Satan, symbolized as a dragon, having authority over one third of the angels of heaven (called "stars"). When we combine this with Isaiah and Ezekiel, the full picture emerges! Satan was a powerful and beautiful angel, a cherub, with high responsibilities, reporting directly to God's throne. He had, apparently, power over one third of the angels. Most likely the other two thirds of the angels were under the direction of the other two cherubim (Michael and Gabriel, probably). Although created perfect, Satan had the power of free choice. He chose to follow the way of vanity and covetousness, and thus became corrupted. He tried to overthrow God, but was beaten back and thrown down to the earth along with his angels, who became demons. Though this may surprise many, the Bible clearly calls Satan the ruler of this world (John 12:31) and the god of this age (II Corinthians 4:4)! Of course, Satan is man's chief tempter (Mark 1:13, 4:15, I Corinthians 7:5). He is the deceiver — not of the few, but of the whole world (Revelation 12:9, II Corinthians 11:14). But how does Satan work? Although spirits can possess a person if given permission, this is not the usual way they tempt or attack. All of us know how every person exudes a power of personality that radiates from him through his moods, emotions and tastes. Thus a person may be said to be the life of the party, or the drag on the company. His or her influence seems infectious for the good or bad of others. Satan, a spirit being, is far more powerful than any human. He is able to transmit, as it were, the attitudes or moods of rebellion, vanity and hate and to infect others with these attitudes, just as surely as a sour person can dampen a party. And this influence occurs without physical contact. Satan is able to "fill" one's heart (Acts 5:3). He transmits his evil moods and attitudes through the "air" (Ephesians 2:2), much like radio waves travel through the air. Yes, we all have been deceived. But the greatest deception of all is the one many people now believe: that Satan doesn't exist in the first place or, if he does, that he is a harmless cartoon elf. The Bible states differently! Satan is a powerful, evil being. His whole purpose, Christ said, is "to steal, and to kill, and to destroy" (John 10:10)! Hebrews 1:7, 2:5-7 — the role of angels is defined. Luke 11:26, II Peter 2:4 Jude 6 — some angels are wicked and have been cast from God. Matthew 9:34 Luke 11:14-19 — the leader of fallen angels is Satan. Isaiah 14:12-15 Ezekiel 28:12-17 — the story of Satan's rebellion. Revelation l2:9 — Satan deceives the whole world. John 12:31, II Corinthians 4:4 — Satan is called the ruler and god of this evil world. Yes, America's stealth bomber may or may not succeed. But one thing is sure: Satan the devil, a hidden but powerful foe of mankind, is indeed the original — and most deadly — disappearing act of all time!